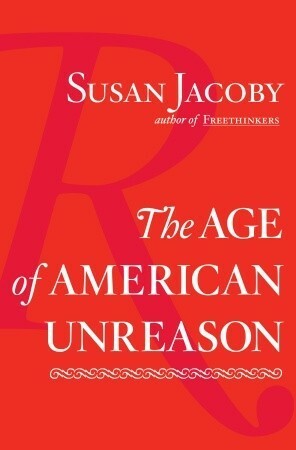 The Age of American Unreason by Susan Jacoby, (2008 Large Type has a different cover image). Cover also says it was a New York Times Bestseller. Alas we have slumped even further into the abyss with Trump, Cruz, Walker, et al on the Republican side. And the anointed corporate puppet pick, Hillary, of the Bankruptcy Act treason of the people, and the Iraq war of the military industrial complex. She who cannot claim any bill or legislation passed that helped women or people of color.